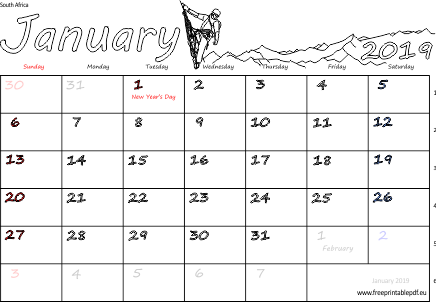 Calendars for January 2019 with week numbers for the South Africa. Guiding theme - high mountain climbing. National holidays included. Download one of two pdf designs and print it. Useful for kids and adults. May be use like nice planner on your fridge.